How are deserts formed? | What are the changes occurred during the formation of deserts? 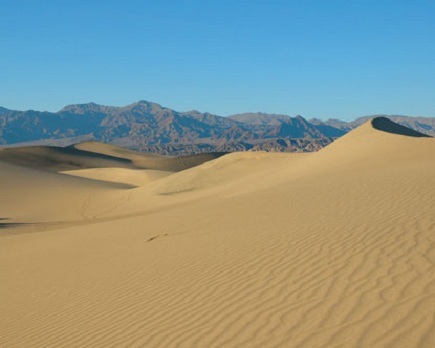 There are many types in the deserts like hot, cold, covered with sand etc. The rainfall is very less in the deserts and the rain water can retain. There are many reasons for the formation of the deserts and the main reason is the movement of air in one direction upto long distances. The air becomes into powder as the moisture content in the air vaporizes. The earth also dries when there is no moisture and the trees, plants in the area die. Most of the deserts are far from the equator as there is no moisture in the deserts. The reason for the formation of desert regions is that the traveling of the air was not there from this side to that side and there were no rains there. The air traveling was not there as there were many hills between the desert region and seas. The rocks in this region may break down into molecules like aluminum iron oxide and silicon when there are acid rains. These parts form like clay or sand and this is the reason for the formation of deserts.